LTE is reality. Today, more than 17 networks using different frequency bands and bandwidths are in operation in various countries. LTE-capable terminals have undergone initial RF conformance testing, but some of the specified test cases have just been finalized in the relevant standard (3GPP TS 36.521-1). Are you familiar with PRACH measurements? And what about power dynamics? Then it is time to take a detailed look at what has been finalized, and what has changed. 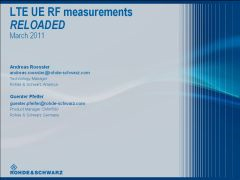 The Rohde & Schwarz webinar focuses on the amendments made to 3GPP TS 36.521-1 and explains the enhanced test definitions. The webinar illustrates on the R&S®CMW500 wideband radio communication tester how the specified RF test cases can be performed and automated, and how the results can be interpreted. The webinar is based on the previous webinar "Make your LTE call now! ".